New Delhi: Delhi’s iconic Signature Bridge was inaugurated this evening by chief minister Arvind Kejriwal. 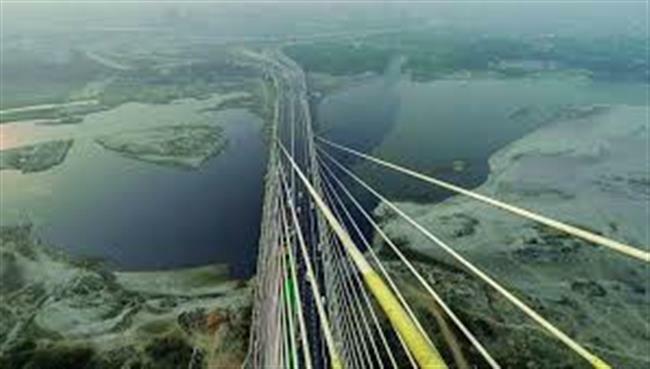 The 675-metre Signature Bridge, which will be opened to public tomorrow, is an eight-lane carriageway that will reduce the travel time between north and northeast Delhi and share the burden of the Wazirabad Bridge. It will also connect the Outer Ring Road on the western bank of the Yamuna river with Wazirabad Road on the eastern side. High drama prevailed just before the inauguration of the bridge after Delhi BJP chief Manoj Tiwari and his supporters staged a protest for allegedly not being invited to inaugural event of the newly-built city landmark. The grand launch, which was marred by the clashes between the BJP and the Aam Aadmi party workers, was followed by a laser show. The bridge, boasts of 127 strands of back-stay cables, spherical bearings of 17,300 tonne vertical capacity, pendulum bearing to resist uplift of 6,300 tonnes, and transportation and handling of 460 tonne pylon base segment and is being projected as India’s first asymmetrical cable-stayed bridge, with the gesture ‘namaste’. The bridge will have a 154-metre-high glass viewing box, which is at double the height of Qutub Minar. According to deputy chief minister Manish Sisodia, who described it as a “civil engineering spectacle”, people can enjoy a panoramic view of the city from there, as in the Eiffel Tower in Paris. Four elevators will take a total of 50 people to the top of the bridge. It will have designated spots for selfie-lovers. The elevators area likely to be operational in two months, an official said. Announced in 2004, the bridge was initially estimated to cost around Rs 494 crore. Later, it was projected to be completed at a modified estimate of Rs 1,131 crore ahead of the 2010 Commonwealth Games, which were held in Delhi.